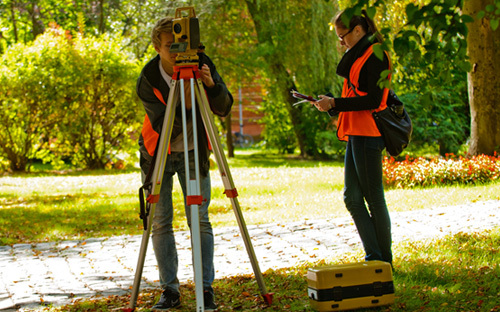 The field of geodesy and cartography at the Faculty of Geodesy, Geospatial and Civil Engineering of the University of Warmia and Mazury received a ‘distinguishing’ mark for the quality of education. This is the only field of geodesy at a Polish university that has received such a high grade. Work on the creation and implementation of the education quality assurance system was started by Prof. Radosław Wiśniewski, PhD, the current Dean of the Faculty of Geodesy, Geospatial and Civil Engineering, who had performed the function of Associate Dean for Full-Time Studies and Education in the previous term. ‘One of the reasons for the granting of a “distinguishing” mark was the education quality assurance system adopted in 2014. It includes, for example, regulations concerning the grading of students’ works and diploma thesis sheets,’ explains the dean. The Polish Accreditation Committee also appreciated, among others, the 55-year-long tradition of the faculty, the competent academic staff, modern equipment and areas of specialisation offered by the faculty. Another factor that contributed to the ‘distinguishing’ mark was the administrative service provided by the dean’s office. It consists of the service centre, which takes care of students from the recruitment process through to the completion of the last subject, and the education centre, which is responsible, e.g., for the processes of granting a diploma, grading of students' works and scientific circles. ‘This is a very high distinction for the faculty. Special thanks go to the employees and the council of the faculty for their numerous efforts and having put the system into practice. I am also very grateful to the associate deans for their painstaking work in the preparation of procedures,’ adds the dean. The Polish Accreditation Committee is an independent institution whose activities are aimed at ensuring and improving the quality of education in Poland. The Committee uses the following grading scale: distinguishing, positive, conditional, negative.